Kicking off the show at its hardware launch, Google CEO Sundar Pichai touted the shift from mobile to artificial intelligence that allowed for two-way conversation and natural dialogue. He described Google’s desire to build an ‘individual Google’ for each user before detailing some interesting AI and machine learning projects, including image recognition, language translation, and text-to-speech. Each of these improves Google’s already impressive Assistant and furthers the goal to create individualized search experiences for each user. We got our first glimpse of Daydream at Google’s developer conference I/O, back in May, although the headset wasn’t really available. Today, we got our first glimpse of the Daydream ‘View,’ Google’s ‘soft and cozy’ fabric-lined VR viewer that’s ’30 percent lighter’ than typical headsets and available in three colors: snow, slate, and crimson. Also nice: It fits over eyeglasses. Unlike Cardboard, the new headset comes paired with a handheld controller that should alleviate the problem of attempting to navigate the VR world through the use of wonky smartphone or head tracking controls. The simplistic remote has full-on motion tracking that’s precise enough for handwriting, and features a two-button control system. It also slides neatly into the headset when you’re done. Pixel is the first Daydream-ready phone, but it won’t be the only one. 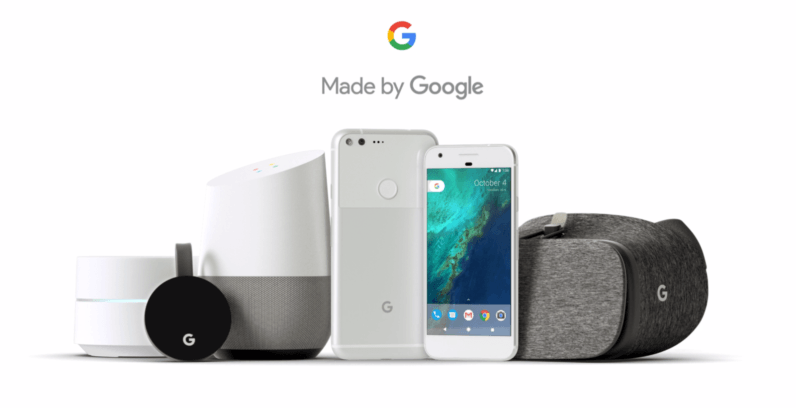 Google is partnering with the likes of Samsung, HTC, ZTE, Huawei, Xiaomi, Alcatel, Asus and LG to provide a stellar mobile VR experience no matter which device you choose. Aside from some amazing games, over 50 experiential partners are coming on board. Google will have its own products — Photos, Play Movies, YouTube, and Street View — as well as content from partners like Netflix, HBO, The New York Times and Hulu. Daydream view and the controller are coming in November for just $79. Google’s new Chromecast Ultra is 4K-capable, and delivers high dynamic range (HDR) and Dolby Vision output. The hockey-puck-shaped device does away with the Chrome branding and adds an ethernet port integrated into the adapter for additional connectivity options. Google says it’s 1.8x faster than previous versions as well as offering improved WiFi performance. The 4K-capable Chromecast Ultra doubles the price of the existing Chromecast 2, at $79. You can get yours in November. Back in May, Google gave us our first look of its Amazon Echo-like smart hub ‘Home.’ Like the Echo, Home is essentially a small speaker that that’s activated with a simple command. It’s powered by Google’s much improved Assistant that can handle all the basics like answering simple queries, controlling music or adjusting connected devices. Aside from that, it supports a plethora of Google-specific options, such as Cast for video viewing, Chromecast Audio, and any other cast-enabled device in your home. Google Home is also contextually-aware. Rather than telling the device you want listen to music on Spotify, if it’s your most-chosen streaming service, Google Home learns where you typically listen. The hub allows for connection across a variety of connected devices from Nest, Samsung Smart Things, Phillips and IFTTT. More device partnerships are planned. Voice control is a central idea of Google Home, but you can also operate the device with a smartphone or tablet. Netflix is on board to support ‘voice casting’ and will soon allow you to completely control playback with nothing more than your voice. Adding multiple Google Home devices in the house allows for whole-house audio, or the ability to pick and choose certain rooms. With a $35 Chromecast, you’ll also be able to extend the voice control to higher end speakers and home entertainment systems. Google Home comes in several colors: mango marine, violet, carbon, snow, and copper. You can get yours for $129 and it’s available for pre-order today. It’ll ship November 4. The successor to yet another Google hardware product (OnHub), ‘Wifi’ is about the size of an Amazon Echo Dot, and packed with smart functionality that allows users to extend its range over an entire house. As the first Google router to make use of mesh networking, Wifi allows users to connect multiple access points as a single, large network. For the user, this means an end to Wi-Fi dead zones throughout the house as well as a strong and consistent signal anywhere with in it. You can snag a single access point at $129, or a three pack for $299. They’ll be available in November.